You have taken tons of pictures and videos and want to create your own an integrated video to memorialize this beautiful experience, so what to do then? 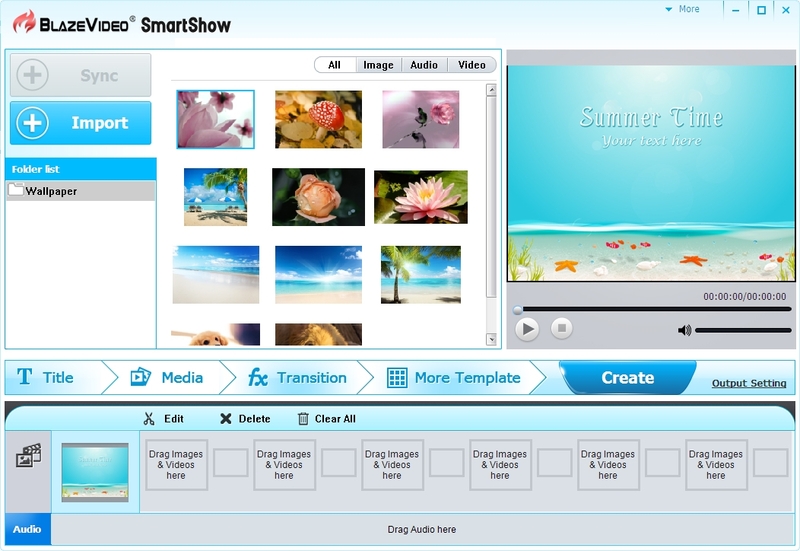 Here, the easy-to-use video editor BlazeVideo Smart Show empowers you to easily and quickly make movies, edit videos, and liven up movies with abundant fantastic effects, templates, titles, transitions, music as well as editing tools. You just need to open your file folder stored on the hard disk or your portable storage device and simply drag your pictures, video clips and music, add transitions and titles into the storyboard. You could stretch the timeline to add more media files and effects at the right box. If you find that your picture are too dark or bright and the size is not suitable, you just need to double-click on the picture and then edit it by adjusting the size, contrast, brightness and saturation, and adding some special effects. A lot of amazing titles fit for any occasion are available, such as make a birth gift for your child with all his or her old photos and add the vivid title as the cover of this special gift, create a wedding handsel for your good friend with the relevant title, or make a movie as a creative Christmas gift. This special program is able to easily export the video into various popular formats which allows you to play it on your iPad, iPhone, mobile phone, computer and more. To enjoy and share your special videos with friends at any time becomes possible with BlazeVideo SmartShow. You can easily merge all your pictures, video clips and music into a fantastic movie by this useful and easy program in minutes.